Established by John Moffatt and William Wright Virtue. John Moffat was born in Newmilns, Scotland, in 1841 and migrated to Queensland in 1862. He became a mining and industrial entrepreneur and developed an interest in shearing machines. William Wright Virtue was born in Glasgow, Scotland, in 1863. He studied at the Glasgow Mechanics Institution from 1875 to 1878 and became a mechanical engineer. Probably due to family associations with Moffat, he migrated to Queensland in 1890 and moved in the following year to the Sydney suburb of Burwood. Virtue devised several shearing machine improvements between 1891 and 1894, and he and Moffat took out joint patents. By 1893 Virtue was Sydney co-director and manager of the Moffat-Virtue Sheep Shearing Machine Co. From 1908, following a capital-raising and diversification restructure, Virtue was general manager of Moffat-Virtue Ltd and the Federal Sheep Shearing Co, Sydney. Moffat retired to Cremorne, Sydney in 1912 and died in Toowoomba in 1918. Virtue retired as managing director of Moffat-Virtue in 1922; he retained a directorship, but returned to Scotland and died there in 1926. To power its sheep shearing machinery, the company first imported and sold Davey Paxman portable steam engines and Blackstone oil engines. It began making petrol engines in Sydney at 205 Clarence Street in 1920, moved production to 11-25 Palmer Street in 1929, and later moved to Rosebery. The company was taken over by Fire Fighting Enterprises Ltd in June 1966. Moffat Virtue cast iron combination spanner for down tube maintenance © Ozwrenches. 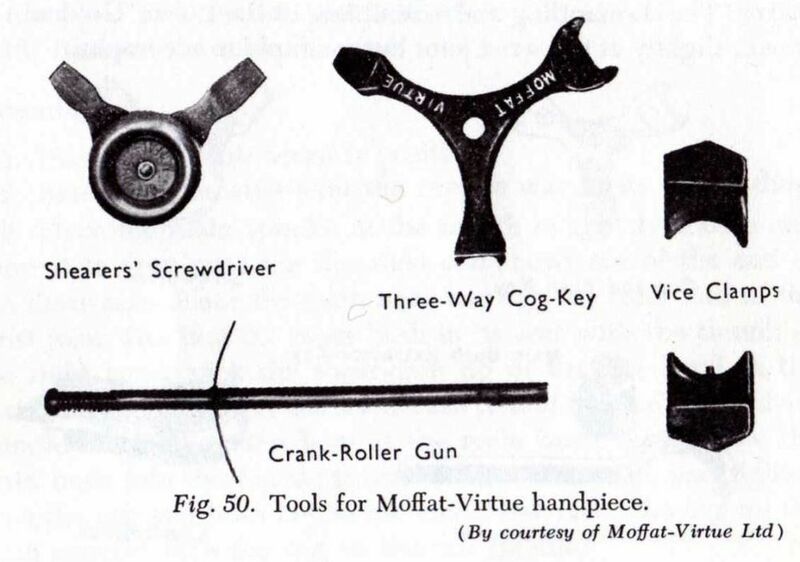 Moffat Virtue C-Spanner for Moffatt-Virtue handpiece.© Ozwrenches. 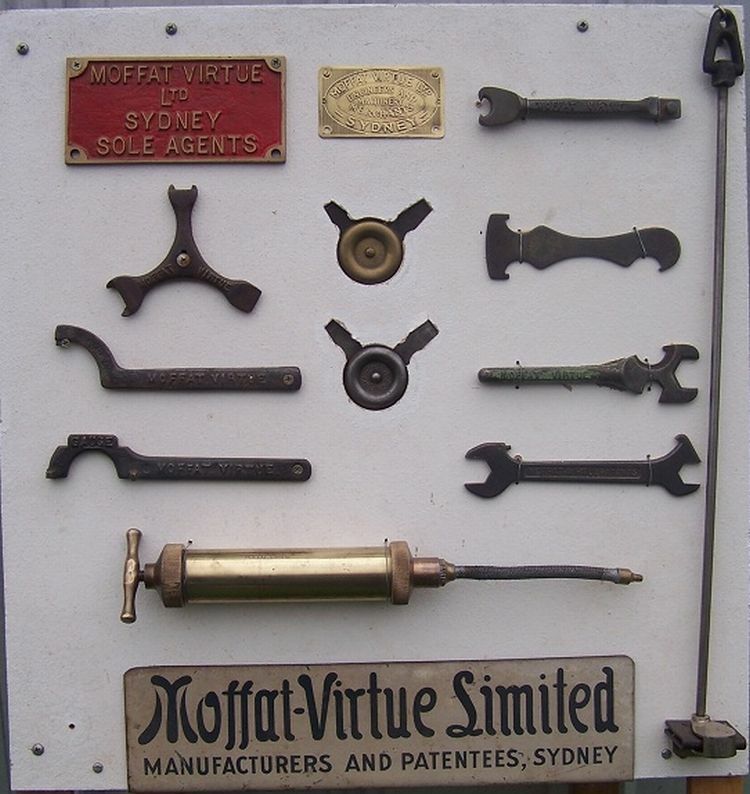 Moffat Virtue Tools Display Panel. © Ron Page.